How to come to the hotel? What to do in Tartu? 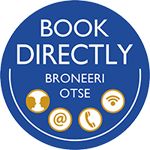 If you are planning longer business trip in Tartu or South-Estonia, then Hotel Sophia is the best choice for accommodation. Restaurant is closed on Sundays.